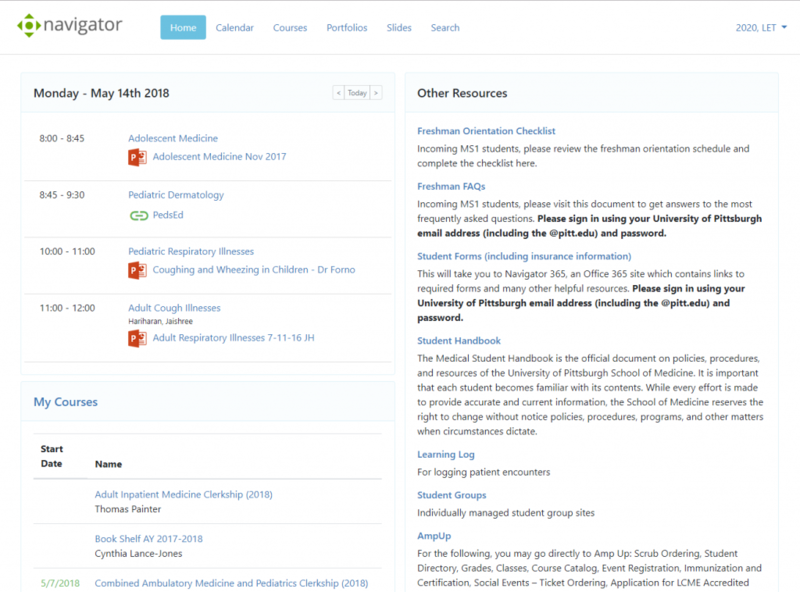 Our core web-based and mobile application, Navigator, serves as the learning management system (LMS) for the University of Pittsburgh School of Medicine. Navigator offers a full suite of learning tools to faculty and students including delivery of course materials, assessments, reporting and metadata tagging. Navigator 5.0 is the one-stop web and mobile site for all medical student online curricular resources. In its 14 years, Navigator has served faculty, students and administration at the UPSOM by providing an online location for class schedules, documents, and web learning resources. In its latest version, Navigator boasts responsive web design, resizing and optimally reformatting to fit various mobile devices as well as laptop and desktop screens. Every course in the first two years of the medical curriculum and all core clerkships in years three and four have a presence on Navigator. Course schedules, documents, web resources, quizzes, simulated cases (vpSim) and more are co-located and organized in fashion compatible with the workflow of a medical student. Self-Assessments provide the user with immediate feedback for each answer that is chosen. They are commonly used in courses for students to review material in preparation for a test. Surveys take the user through a series of questions without any feedback. They are used for data collections purposes, often to get student feedback on a course or topic. Quizzes allow students to move through a series of questions with feedback optionally provided at the end. They are used for more formal types of assessment where the instructor does not want the student to know immediately if he or she has answered correctly or not. Navigator offers a variety of reports for both course directors, the curriculum committee, and the Office of Medical Education. Reports for Navigator assessments are available to course authors at any time through the authoring interface. We also work directly with these groups to create custom reports to answer specific questions about students’ learning activities. In collaboration with a third-party developer of board review questions for the USMLE, the Lab created a novel program to have questions integrated with the UPSOM online curriculum. Course directors hand-pick questions that relate to their course content, and these questions are embedded alongside associated course materials in Navigator. Working with OMED, we obtained board review resources for all first and second-year medical students. Initiated by the AAMC, Curriculum Inventory is the central database of content, structure, delivery and assessment of medical school curricula in the United States. Navigator provides an easy to use mechanism for members of the Office of Medical Education to tag curricular events with the appropriate metadata. The Laboratory for Educational Technology performs an annual upload of this data to the AAMC every September.